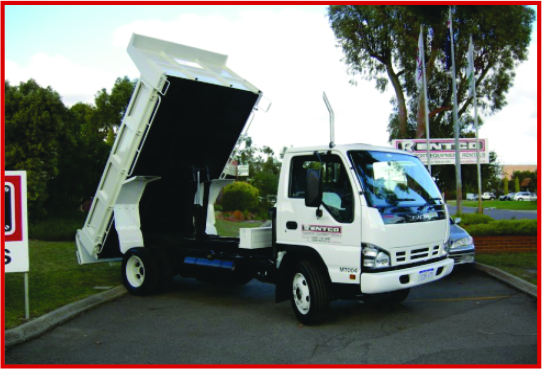 When you’re looking for a mini tipper with a mighty range, you can’t go past Rentco’s Mini Tipper truck rental. With a generous 3.5 cubic metre body and a two-way tailgate, this little workhorse ticks all the boxes. Perfect for moving small loads, clearing smaller sites or picking up supplies, Rentco mini tippers are an affordable solution when you have a job to do. These compact trucks provide the perfect partnership with earthmoving and construction equipment. Our mini tipper trucks come equipped with two way tailgates, which simplifies unloading, and their size makes it easy to navigate narrow driveways or tight spots on site or around town. Mini tipper hire trucks are very adaptable. The generous cargo space can accommodate a decent load, saving you time and money. Easy to load and offload, our tipper trucks help you to get the job done fast and efficiently. Rentco mini tippers are built for hard work. Driver comfort and safety is taken care of with lots of great interior features including air conditioning, power steering and radio. Plus, there’s plenty of room in the cab for an extra passenger. If you have to move materials and equipment from site to site, the tow hitch means you can load up your gear and take a trailer along with you. A mini tipper truck is a safe and efficient way of transporting loose materials. Whether you are a contractor, construction company, supplier, or farmer, a tipper truck is one of the most useful tools of the trade you can find. Our clients tell us that a rental truck is an affordable way to bridge the gap when one of their own vehicles is in for repair or when they need a specialised vehicle for a specific project. So, whether you’re undertaking site clearance, demolition or carting grain, sand, aggregate or soil. Rentco offers very competitive rates for short or longer term tipper truck hire. Whatever the occasion, Rentco has a mini tipper hire truck to meet your needs. We pride ourselves on offering very competitive rates for short or longer term hire, and offer the bonus of 24/7 national breakdown support service. Our fleet of modern, well maintained mini tipper rental trucks are always primed and ready and waiting to help you get the job done. We operate Australia wide - with outlets in Perth, Adelaide, Melbourne, Sydney, Brisbane, Townsville and Darwin, you enjoy the benefit of reliable local service backed up with the strength of a national network. Whatever the application, we’re confident we have a rental vehicle to meet your needs.